Submitted by Jeff Buster on Tue, 03/25/2008 - 15:11. Cuyahoga County owns the University Square Plaza parking garage. The garage is managed/operated by Inland Management. 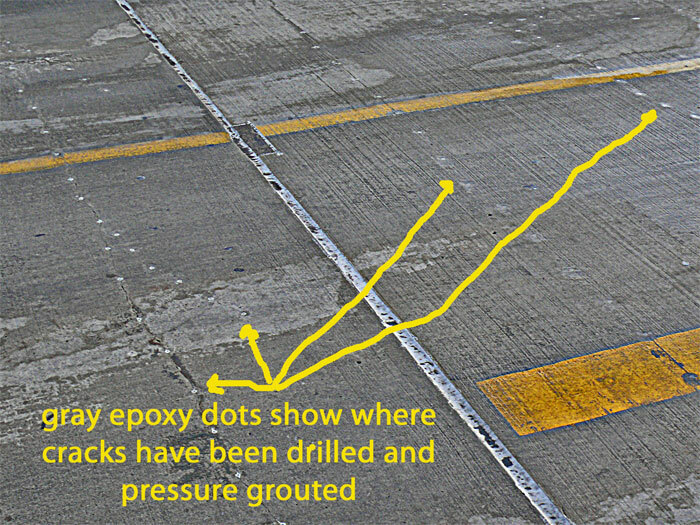 Many of the concrete pre-stressed double T planks have failure cracks both at their ends, and all the RAMP planks, like the ones in the photo above, have cracks longitudinally along the outer unsupported edges of the T. Notice how the gray-colored caulking between the edges of adjacent double T planks is stretched and webbed. That means the edges of the planks are moving away from one another. They are moving away from one another because the edges are sagging down. You can feel the sag as a bumpety bump when you drive up or down the ramp. On the top side of the ramp T planks the cracks are visible with every plank cracked on both edges. Most of the cracks (which span the width of the ramp) have been drilled and epoxy injected, and most have been re-supported on the underside of the T beam with the short steel I beams you can see in the photo below. When the T beams were designed they were not intended to asymetrically support drilled in steel beams on one side (or on either side). The pounding traffic loading from cars passing over the T beams will now cause the steel beam to flex the vertical leg of the T. This will cause further cracking. The staging in the photo(above), which was occupied by the installation laborers just minutes before I took the photo on March 18, 2008, is unsafe and violates OSHA regulations because there are no railings abound the top of the staging frame. Railings around the work platform are necessary to protect a worker if they slipped or lost their balance. A decade ago my friend, Craig Miller, was working removing a steel beam from a sewer pumping station when he lost his balance and fell from just such a height of staging. Craig landed on the front of his face on the concrete floor. It almost killed him. I visited him 3 days after he had been med-evac’d to a trauma center. He underwent a series of plastic surgeries and when I saw him his face was full of rows of stainless steel staples so he looked more radical than Frankenstein. He never went back to construction work. He’s never been quite the same Craig. Why is the work at University Square being pursued in a manner which endangers the employees doing the work? Are Inland Management’s employees doing the work? Since the County owns the structure, you might think that the work is being done union or at least prevailing wage. Is it? If one of the workers here is seriously hurt, who will be sued? Answer: EVERYONE from the subcontractor, to Inland, to the Architect and Engineer, to the City of University Heights, to the County of Cuyahoga. And probably also the staging manufacturer and a few others. Atty. Dennis Wilcox is working for the Cleveland-Cuyahoga Port Authority and is involved in the discussion and communication with Inland Management about the failure of the concrete T beams in the University Square Plaza garage. Dennis Wilcox was the attorney for Starwood Wasserman back in 2001- 2003 when Starwood Wasserman hired Suffolk Construction from Boston, Massachusetts to build the University Square Plaza and garage. Suffolk hired Hybrid Parking Systems to design and engineer the parking structure. Alan H. Simon, P.E. appears to be the engineer of record on the University Square Plaza garage, Ohio license number (E-65904) . Mr. Simon worked for Hybrid Parking Solutions, LLC and now works with Simon Design Engineering. I have reason to believe Hybrid Parking is out of business. The telephone (617-923-0304) at Hybrid parking rings “temporarily out of order”. At the time that Mr. Wilcox worked as legal counsel for Starwood Wasserman to obtain the 40.5 million of Port Authority money, who was the legal counsel for the Port? Why would legal counsel for the Port – or anyone - lend millions to be repaid from a 30 year TIF for a parking structure which wasn’t even going to last for 30 years? Why would Mr. Wilcox now (working as legal counsel for the Port) be helping Inland Management LLC in seeking money (said to be 7 million) to modify and repair the garage without confirming that leveraging the Port even further on this project wouldn’t be throwing good money after bad? Will Mr. Wilcox attempt to define liability for the T beam failure? Could Mr. Wilcox’s prior client Starwood Wasserman have liability for faulty engineering which has allowed the T beam failure? Was the sale of the property from Starwood to Inland done with the knowledge that the garage T beams were failing? When did Mr. Wilcox become aware that the parking garage, owned by the Port, had failing T beams? As counsel for Starwood was Mr. Wilcox responsible to notify the Port that the T beams were failing? At the time the Plaza was sold to Inland, was Mr. Wilcox counsel to Starwood? Was Mr. Wilcox also counsel to the Port? When was Mr. Wilcox on the Port Board during this time period 2000 – to present. How did Mr. Wilcox vote on the Port Board with regard to this property? Will this be similar to the Ferchill Group development at Myers University where Port loans of approximately 6 million are in default.? 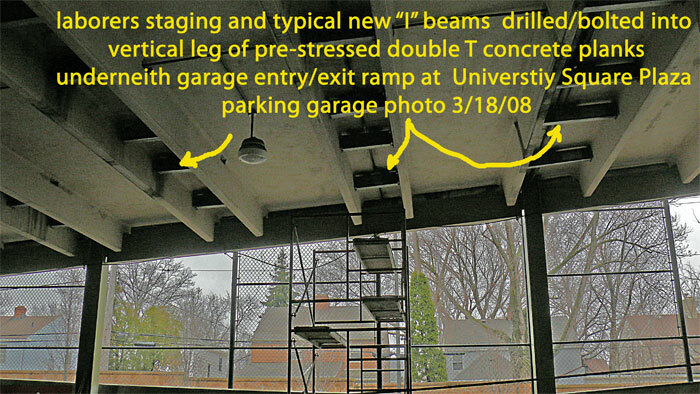 Since it is predictable that (with additional traffic over them) ALL of the T beams in the garage will crack longitudinally like the T beams in the ramp, why would it be sensible to put any more money into the garage without conducting a cost study on piecemeal repair of planks vs removing and replacing all the planks? Will Mr. Dennis Wilcox be involved in the bonding for a MEDCON should that development proceed? Mr. Wilcox was involved as counsel with bonding for the Browns' Stadium and the Gateway Development and for the bonding of the Rock and Roll Hall. N.B. this post is the 3rd in a series on University Square. Search for "University Square" iin the Realneo searchbox to find the two previous posts. Is University Square Economic Development? Submitted by Norm Roulet on Tue, 03/25/2008 - 22:50. Is there any indication that, at its very best, without the failing garage, that University Square has had a positive "economic development" benefit of any significance to anyone in NEO, other than a few rich people... Don't include salesclerk jobs... I'm talking increased property values, taxes, people moving into the neighborhood, crime reduction, area locally owned businesses increasing sales, improvements in traffic congestion or the environment... anything measurable? Submitted by Evelyn Kiefer on Wed, 03/26/2008 - 00:17. I have been reading your posts about bad concrete jobs around the city with great interest . I appreciate your expertice. With the little knowledge I have of contruction materials and techniques I would never notice such things. If you have time, could you post something about what normal wear and tear for such a structure should be and maybe an example of a similar project done well? Has any recent construction project in NEO been done really well -- if so by whom? Submitted by Susan Miller on Wed, 03/26/2008 - 10:28. Jeff and I had been to the University Heights Building Department to ask about the work. Jeff had made a public records request the day before. The document they produced was incomplete (it said see letter from Dennis Wilcox attached, but there was no letter from Wilcox attached). The cover sheet Jeff had filled out the day before had a note about homeland security indicating that giving out these public records might be a security breach. The other note said “see law director”. The staff person who produced the two page letter was nervous and most of the staff would not talk with us. We asked for the whole file. They said that we could ask the Mayor. Before seeing the mayor we went to the facility to see if the shoring had been supported all the way from the ground to the top of the parking garage and to see if the stores and parking facility had an occupancy permit. Jeff took the photos and showed me how the freezing and thawing and the flexing of the concrete and steel was bending one of the vertical steel structural beams right by the entry way to Macy's. We went down the elevator and asked in Macy's about the location of the management office or if Macy's had an occupancy permit. We followed the clerk's directions to get to the Inland Management office where we went in and asked to see the occupancy permit. The manager Brian Dor said he would have to get it - it wasn't onsite or something. Jeff said, OK and I began to peruse the drawings in the hallway outside the office. Dor immediately picked up the phone and began talking. I have no idea who he was calling nor did I hear what he said. Moments later a security officer told us we had to leave. OK we said. He followed us out into the parking area. I asked if he was escorting us off the property. He said yes. Why? I wondered. "Because I was asked to." We returned to University Heights City Hall and had a nice chat with Mayor Beryl Rothschild who gave us the documents she had on hand from a city council meeting the night before. She and Nancy English, UH Clerk of Council were very cordial. It was a nice follow-up to being "removed" from the public-private facility just across the street. Hoping the FBI continues to CLEAN HOUSE in North East Ohio indefinitely!!!! Social Justice at large....Disrupt Corruption!